Pain from an abscessed tooth is like no other kind of toothache pain. While mild toothache pain may come and go, the pain from an abscess is constant and severe. Ignoring severe toothache pain from an abscess can result in serious complications if the infection spreads throughout your body. Prompt dental care is necessary if you experience the symptoms of an abscessed tooth. Tooth abscesses occur due to an infection of the tooth or gum. Infection can occur as a result of tooth decay or trauma to the tooth, according to the National Institutes of Health. The infection causes pus to develop inside the tooth or at the gum line, triggering toothache pain. Abscess toothache pain occurs due to three types of abscesses. A periapical abscess begins in the pulp in the center of the tooth, while a periodontal abscess begins in the bone tissue supporting the teeth. A gingival abscess occurs when the abscess is limited to the gums. This type of abscess doesn’t involve the teeth. A painful, throbbing toothache is the main symptom of an abscessed tooth. Sharp or shooting pain may occur in the teeth, neck, ear or jaw. Other potential symptoms include bad breath, sensitivity to hot or cold substances, difficulty swallowing, trouble opening the mouth, a bad taste in the mouth or pain when eating or chewing. If the infection progresses, you may develop a fever, feel ill and notice swelling in the neck or jaw. Medical News Today reports that the toothache pain may begin suddenly and become more intense over subsequent hours or days. In some cases, the dentist removes the pulp and nerve from the tooth during a root canal procedure. The procedure is effective in stopping the infection and saving the tooth. Abscesses affecting the gum line and bone may require drainage. 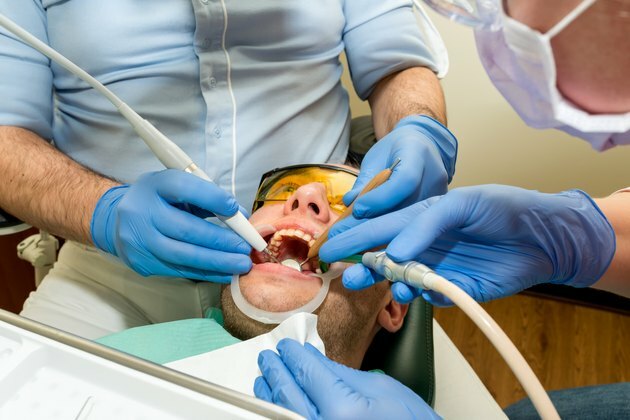 If an abscess on the gums occurs due to a build-up of plaque or tartar, your doctor may suggest a deep dental cleaning to remove these substances. Antibiotics may be used in conjunction with other treatments to fight infection. Pain is also treated with over-the-counter or prescription pain medications. Ignoring the pain from an abscessed tooth can lead to life-threatening complications, according to the National Institutes of Health (NIH). Possible complications include tooth loss, bacterial blood infection or mediastinitis, an inflammation of the space between the lungs. The infection may spread to the soft tissue of the mouth and face and can cause pneumonia, brain abscesses and other serious conditions. Medical News Today: What Causes Dental Abscesses? Why Does a Toothache Come & Go Every Few Months?